FluorideMaster: How does it work? The FluorideMaster™ Whole House Water Filtration System is completely loaded with high-grade FluoriSorb™ media designed to completely remove or significantly reduce fluoride (commonly found in city/municipal water supplies), sediment and/or particulate matter from all of the water entering your home for about 400,000 gallons or 4 - 6 years. The Fluoride Master™ system utilizes approximately 60 pounds of high-grade FluoriSorb™ media (known as Hydroxyapatite/Bone Char) which is considered to significantly outperform other fluoride reduction media such as "activated alumina." The FluorideMaster™ does not contain any "activated alumina." 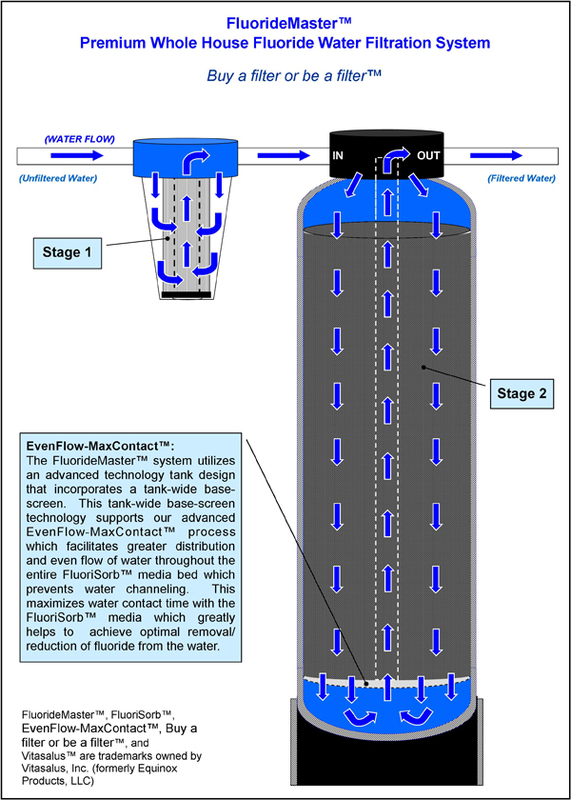 The FluorideMaster™ Whole House Fluoride Water Filtration System incorporates two filtration stages which are depicted and described below. STAGE 1: The 0.35-micron prefilter, housed in a clear canister for easy visual inspection, is a replaceable cartridge that mechanically filters down to 0.35-microns. This important first stage filters the undesirable sediment or particulate that may be present in the water supply so that it doesn't clog the main filter and reduce water flow and/or filter life. Also filters out copepods and cysts which may be present in your water supply. STAGE 2: The water supply passes through approximately 60 pounds of our high-grade FluoriSorb™ media which is designed to completely remove or significantly reduce all of the fluoride typically found in city/municipally-treated water. FluorideMaster™, FluoriSorb™, EvenFlow-MaxContact™, and Vitasalus™ are trademarks of Vitasalus, Inc.